For example, if you have flooding problems or a few large dogs, you’re probably looking for synthetic grass with superior drainage to keep your lawn dry. If you are planning a play area for your children, you may want something with good fall protection ratings. 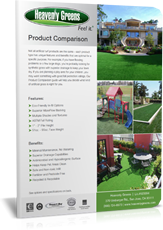 Our Product Comparison guide will help you decide what kind of artificial grass is right for you. Download our guide now by filling out the form.